When Isuzu Japan decided to stop making large SUVs it prompted IM Group into radical rethink, Matt de Prez reports. Pick-up sales reached record numbers in 2017 as the commercial vehicle market shifted away from traditional vans to 4x4s. 3.5 tonnes fell by 2.9%. 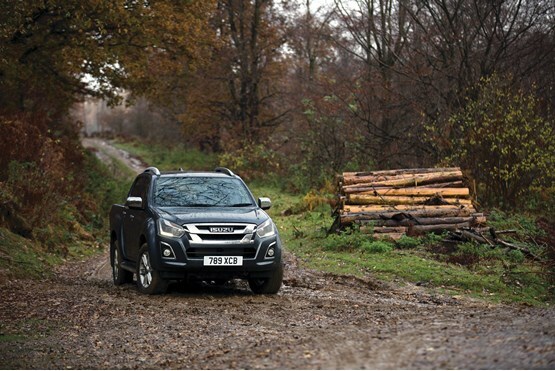 Isuzu has been one of the beneficiaries, with the D-Max hitting 6,000 registrations. However, until 2005 the brand didn’t even have a foot in the pick-up market. Its main model was the Trooper – a successful, large SUV that rivalled the Land Rover Defender. With little warning Isuzu Japan discontinued production of the Trooper, leaving Isuzu UK – the official distributor and part of IM Group – with a real conundrum as its business was entirely built around that vehicle. At the same time, operations director William Brown, joined the business as regional sales manager. “We switched from selling SUVs to selling pick-ups. The business was not prepared for that transition and neither were the dealers,” he says. Following the recession, Isuzu registrations had hit an all-time low of 1,000 units per year and the business needed to make a decision about whether it was viable to continue its distributorship or end its relationship with the brand. IM Group decided to invest in Isuzu but quickly realised a new challenge. Historically, Isuzu and Subaru were sold to dealers by IM Group as a pair. With cars and SUVs this model worked without issue. Tasked with selling a pick-up, dealers struggled to get to grips with the completely new world of commercial vehicle sales. “We spoke to the network and told them we were going on a journey and if they didn’t want to be part of it, now was the time to leave. At that point we did cut ties with a lot of our dealers and decided to take a new approach to franchising,” explains Brown. The company looked at new retailing models such as using agricultural and truck dealers instead of traditional car dealers, but also looked at used 4x4 and commercial dealers that had not held a new vehicle franchise before. Since 2010, the company has replaced two-thirds of its network and embarked on a new marketing campaign to promote itself as ‘the pick-up professionals’. “Training was a milestone that helped us get on the right journey,” says Brown. “Our training covers issues such as funding, VAT, tacho legislation and towing legislation. Brown believes Isuzu has the best working vehicle on the market and said the D-Max is aimed clearly at customers who need a vehicle to do a job. “Our message is we’ve got the best working vehicle out there. We may not be the most SUV-like, but that is not an area we want to dominate. “If you want to tow, if you want to carry a lot of weight, we’ve got the best product and, for those that want to listen, we can prove that,” he says. The D-Max was the first pick-up to offer a 3.5-tonne towing capacity and the first to come with a five-year warranty, features that are now industry norms. A revised model launched last year with a 1.9-litre four-cylinder diesel engine, against a trend of larger-capacity rivals. The new engine meets Euro 6 standards without the need for AdBlue. Brown explains: “There are very few pick-ups that don’t have AdBlue; that is great for convenience and running costs. “The biggest advantage of a smaller engine with no AdBlue is the pickup is lighter, so payload is better, economy is better and performance and handling is better. “When our payload increased, most of our competition’s got worse. That has been a big tick in the box, particularly for fleet business. Fleet is a growing opportunity. Just 20% of D-Max sales went to this sector last year. Most are classed as ‘retail’, which, in reality, is SMEs – often sold to farmers, builders and tradespeople. Isuzu’s fleet operation predominantly serves utilities and civil engineering fleets. Its most common vehicle is a converted cherrypicker. Conversions are managed in-house and are tailored to specific fleet requirements. A team of approved converters is used to complete the modifications and the customer receives the vehicle ready-to-work with one invoice. “Key to providing a good fleet service is the quality of the dealers,” says Brown. Isuzu has more than 100 dealers, which is quite big for a one-model brand. Brown says customers should not have to travel more than an hour to reach a dealership. Fleets with fewer than 25 vehicles will generally be handled at dealer level, while larger companies buy from Isuzu direct. All aftersales business is handled by the network. “If you are a big fleet customer that has a big fleet of pick-ups, our network only deals with pick-ups. All our technicians are solely trained on how to fix pick-ups. "We can fix and diagnose things quickly because every day it’s the same vehicle over and over again,” adds Brown. He believes having a network that is purely focused on pick-ups is a big advantage for the customer, be it retail or fleet. This year, Brown says the business will continue on its growth path. He raises concern over the trend away from diesel in the car market and fears that the lifestyle end of the pick-up market could be affected. However, he is confident that downsizing the engine in the D-Max from 2.5-litres to 1.9-litres was the right thing to do. “I have comfort that the technology we have will see us through for a very long time. Brown suggested hybrid and electric powertrains will be inevitable as manufacturers strive to reduce average CO2 emissions, but warned that the technology may not provide the same practical capabilities that fleet customers require. Isuzu has announced the new generation D-Max Arctic Trucks AT35 will be available from October 2017. Isuzu has launched the new generation Huntsman accessory pack which is available on D-Max Utah Double Cab variants.